Team SEArch+/Apis Cor winning design for the latest phase of the National Aeronautics and Space Administration’s (NASA’s) 3D-printed Habitat Challenge. Three teams won the complete virtual construction contest, the latest stage of the National Aeronautics and Space Administration’s (NASA’s) 3D-printed Habitat Challenge. They were awarded a share of the $100,000 prize purse. SEArch+/Apis Cor, New York, won the top place as well as $33,954.11. The unique shape of their habitat allows for continuous reinforcement of the structure. Light enters through trough-shaped ports on the sides and top. Team Zopherus, Arkansas, won the second place and $33,422.01. The team’s design would be constructed by an autonomous roving printer that prints a structure and then moves on to the next site. The virtual design from team Mars Incubator, Connecticut, won the third place and $32,623.88. The focus of the 3D-printed Habitat Challenge is to create sustainable shelters suitable for the Moon, Mars, or beyond using resources available in these locations. The multilevel challenge that began in 2015 put teams to test in several areas of 3D-printing. 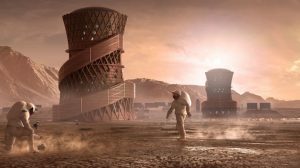 The latest stage of the challenge required teams to create a full-scale habitat design, using modeling software. Eleven team entries were scored and awarded points based on architectural layout, programming, efficient use of interior space, and the 3D-printing scalability and constructability of the habitat. Teams also prepared short videos providing insight into their designs as well as miniature 3D-printed models that came apart to showcase the interior design. Points were also awarded for aesthetic representation and realism. After evaluation by a panel of judges, NASA and challenge partner Bradley University of Peoria, Illinois, decided the winners. The 3D-printed Habitat Challenge will culminate with a head-to-head subscale structure print contest from May 1 to 4, 2019, in Peoria, and the awarding of an $800,000 prize purse.